Tattoo laser removal – Just got my elbow zapped here for the third time and I’m getting great results. They have fair prices and a great staff. My only advise is ice the area well before going because it hurts and that’s about the only thing that will help with the pain. On the positive side they are fast. If you can sit through an hour+ tattoo session you have no reason to be scared of a few minutes with tattoo laser removal. It hurts. Don’t get me wrong. But that’s the fun of it! Right? My laser tech, Ellen has been informative, thorough, and efficient covering all the details of what I should experience with my results. She made me very comfortable and walked me through any questions I may have had. I have NOT experienced any scarring on my 50 square inch of tattoos I’ve had treatments on. (That’s a lot of skin coverage and a lot of sessions) I probably won’t ever get used to the pain, but watching the results of laser tattoo removal makes coming back more desirable. Thank you for a quick and painful experience Ellen. I am an English guy in my late 50’s. I’m originally from London, but have spent the last 10 years in the desert and 22 years before that living at the beach in Southern California. I have a very light complexion and blond hair and have been highly prone to sunburn my whole life. The sun doesn’t come out much in England, so during our summer school break if it was sunny I laid out in a determined but usually unsuccessful attempt at getting a tan! We didn’t know what SPF was in those days so any creams we used were known as “sun tan cream”. I suspect they were largely oil-based so I basically fried myself multiple times in my youth, with some memorably awful burns! On top of that I was good at sports so spent hours on football and rugby fields and training on the track, without ever using sun protection products. 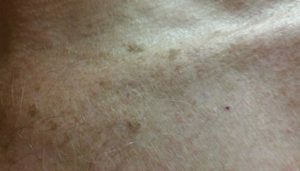 In addition to having freckles that were always there but grew more pronounced by exposure to the sun and with age, I gradually developed sun spots as I grew older. 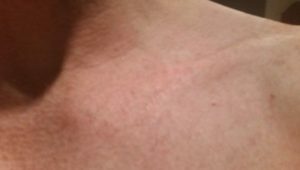 These were particularly visible on my chest and shoulders. After passively watching these sun spots get more pronounced over the decades I decided to try to remove some. Ellen explained the process to me, told me there would be some discomfort during the few seconds the laser was being applied (although not as painful as tattoo removal) and it would probably take three or four sessions. She targeted six pronounced sun spots and I was pleasantly surprised to discover the process only took a few seconds on each and although it hurt a little, it was not as painful as I’d imagined. The six sun spots turned light red and remained a light reddish color for a few weeks, gradually fading. Four or five weeks later I went in for the second session and had a repeat experience – sitting in Ellen’s lovely office for a few minutes, some slight pain but entirely bearable. The sun spots turned red again and I soon forgot that I’d even had the procedure. I then went out of town on business and a vacation. About seven weeks after the second session Ellen asked how the sun spots were looking. I honestly didn’t know without looking and was shocked to discover that they had completely disappeared! Less than three months and with only two short sessions and my skin looked completely clear for the first time in about 30 years!